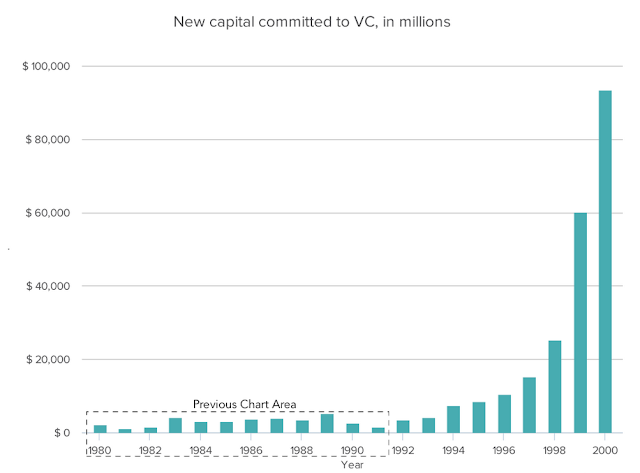 Via Dominic Cummings (@odysseanproject), this long discussion of the history of venture capital, which emphasizes the now largely forgotten 1980s. VC in most parts of the developed world, even large parts of the US, resembles the distant past of the above chart. There is a big gap between Silicon Valley and the rest. From a rational expectations point of view, risk is uncertainty in your lifetime utility. Consumption is often treated as a proxy for utility. The discount factor you apply to some uncertain stream of cash flows should depend on how those cash flows correlate with everything else that goes into determining your lifetime consumption. People have created new markets before and there are plenty of examples to look back to. This market risk can be quantified to some extent and so VCs can comfort themselves in thinking they've applied the right discount factor and bid the right price. VCs typically wait until there is some market validation to feel secure that 1. there is a market and 2. the team they're funding can get the job done. Technological uncertainty is unquantifiable risk. Rational expectations has little to say here. You don't need Eugene Fama to tell you how to think about it. You need Prometheus to say "screw this, I'm going to do it and I'm going to change the world." <- This is the type of area in which government subsidies might actually make us all better off.